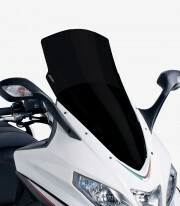 Get now the V-Tech Line Touring Black short windshield for maxiscooters from Puig. The V-Tech Line Touring model windshield manufactured by Puig it's been developed in a wind tunnel to improve the aerodynamic coefficient. Thanks to that, it's possible to reduce the pressure of the wind against the pilot while you are piloting. It have dimensions usually greater than the stock ones and its angled design redirects the air to the sides of the pilot at the same time that it grants a more racing aspect. It complies with the TÜV and ABE 38120 approval that is why you will be able to pass the ITV without issues. Its measurements are: 700mm wide by 350mm high.